Clad in their traditional costume, the girls are giggling while they look at us, the white farangs. They are Akha and display proudly their bells, jewellery and woven clothes. Not far from them, Lahu children run together while Karen mothers take care of their babies. Today is a day of celebration at San Hog Far village. The new San Hog Far Hill Tribe Children’s Village was completed from start to finish in an amazing 100 days. Eight years ago, eleven hill tribe villages gathered together and agreed that the only way out for their children was education. They were from four different hill tribes – namely Karen, Akha, Lahu and Lisu – and they decided to send their children to study in Phrao to give them better chances for the future. That implied that the children, who lived six hours from Phrao, had to stay in the city during the night. They slept on the streets, in wastelands, in makeshift bamboo shelters rented by Phrao inhabitants. This unsecured environment was the perfect ground for child traffickers. And indeed they came, and indeed children disappeared from time to time. And this is where Edward Wayne and Tatjana Trickovic came in. After running a successful business for a long time, Ed realized his children would not take the company over and thus decided to sell it. With the money he made out of the sale, he went around the world and launched projects: sewage system in gypsy communities in Serbia, school in Nepal, housing project in Khao Lak for tsunami orphans … You name it! 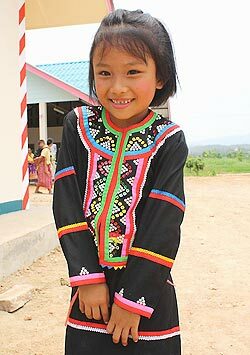 One of the village’s new residents - a shy and very young hill tribe girl smiles for the camera. They took the fate of the hill tribe children to heart and decided to build a village to host them during the night. 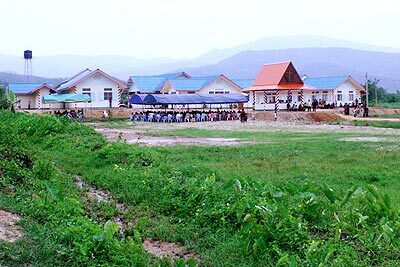 One hundred days later, the Hill Tribe Children’s Village is born. It will host 40 boys and 40 girls from 6 to 16 years old, as well as 3 couples from the villages who will look after the children. The children are chosen by the villages’ councils - the ones who lived the farthest away first, and then the ones who show the most motivation for education. With a fish pond, a sports ground, 8 computers connected to the internet, a kitchen in which they can cook dinner and bake cakes, the children will find a real improvement to their previous conditions. Each dorm of 20 will form a team, choose a colour and war cry, and will compete with other dorms in friendly games. The parents will cook breakfast and dinner at the village but lunch will be taken at school, which is a 15-minute ride away in the village’s two trucks. Far from the missionary pressures that permeate some hill tribe projects, Ed and Tanja decided that religious education and activities would not be allowed at the village. To keep the children busy in the evening, the assistant project manager, Tom, will go there three days per week to teach English and organize games and fun activities. He will also make sure that village life goes smoothly and according to plan during the first six months. What is really important about this village is that Ed and Tanja “merely” helped the children by building a safe place to live, study and play. These children will, however, need more external help in providing food, school supplies and daily needs. It is estimated that the financial needs for 80 children and 6 adults will be 100,000 baht per month, about $3,000, which will cover food, electricity and water, fuel for the two trucks and other necessities. .
Ed and Tanja are soon going back to Serbia for another project; the success of San Hog Far village now depends on you! If you want to teach computer sciences or English, play with the kids or bake cakes with them in their brand new kitchen, then you can enjoy the guest room at the village. If not, please consider giving a few baht to the project to give them a real chance of success. You can do this by contacting Tom, (Pairoj Topa), at [email protected] or by phone at 089-838-3135. To discover more about Ed and Tanja’s projects, please visit the website of their foundation at www. thebridgeoflife.net. After their Charity Christmas Party fund-raiser, Thailandfreunde Section Thailand had promised the children at the Croston House Orphanage in Lamphun a fun day out at Mae Sa Elephant Camp. The anticipated day took place on May 5, and ‘fun’ it certainly was! The 24 children, aged between 3 and 16 years, were accompanied by 8 adults, who were looking forward to spending time with the elephants as much as were the children. The group were some of 300 visitors to the camp that day, well below normal numbers, but at least visitors are still coming. the Croston House kids had never been to an elephant camp before, and it was wonderful to see the respect with which they greeted the great grey jungle giants, so symbolic of Thailand itself. The best part of a wonderful day – the Croston House children enjoy an elephant ride through the jungle. The camp does not only exist as a tourist attraction; elephant trainers worldwide come to be educated in elephant ways, and the camp is also heavily involved in supporting the in-vitro artificial insemination project at Lampang’s Elephant Hospital, in order to ensure the survival in the kingdom of the Asian elephant. The children were fascinated to learn that each elephant eats between two and three times its own body weight every single day, and drinks up to 300 litres of water. Mahouts explained that taking care of an elephant’s skin is very important, and has been made part of the entertainment at the camp, with bathing pachyderms happily drenching watching visitors with sprays of water from their trunks! The show itself entranced the children, impressing on them the intelligence of the giant beasts. From elephant football to a darts competition with a member of the audience, including everyone’s favourite, elephant painting, and even elephant music played on a harmonica, the kids were amazed at how cleverly the elephants performed each task. 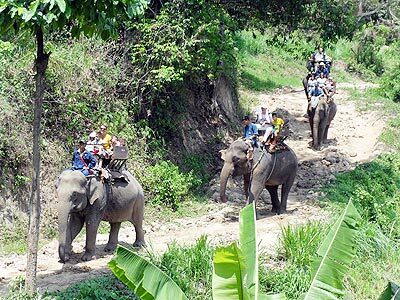 But, the treat of the day was feeding the pachyderms with sugar cane, then being taken for a 30 minute ride through the jungle on their giant grey backs! The whole wonderful day was captured on film for the kids, so that they can relive their happy memories.